Sparkle Cartel is a ‘we have one thing right now in limited supply so hop to it and buy one before it’s gone’ kinda place, so when Lloyd said he liked this style of ring, I had purchased two before he finished speaking. A size 7 and a size 9. Select! Add to cart! Check out now! Confirm my order! Pay! Done! They are too big. In fact, I’m not actually sure what my ring size is, so this was a major goof. To make matters worse, before I got home Lloyd checked the website and they had the ring that he really wants. We will not be buying it. Thanks to both Brad (for advertising sparkle cartel) and Lloyd (for telling him about sparkle), I am ADDICTED to that site. I nearly bought the ring that you got. I did buy the bottom ring -- the one you didn’t purchase. They have a no hassle return policy, so you can return the rings for a full refund, minus shipping, within 90 days. Or I could buy the size 9 from you. I’d happily help that way. I could also check to see if anyone I work with is interested in the 7. Hey! We’ll be ring buddies! We can play Wonder Twins! Dang. I’m sorry to hear that. I’m also sorry to tell you that I’ll be posting about that second ring when it comes to me in the mail. I ordered one yesterday. On the bright side, I’ve noticed that the jewelry on Sparkel Cartel repeats itself a lot. Wait a few weeks, and something you’ve seen before comes ’round again. I agree with Brad. I’ve seen that bottom ring just a couple of weeks ago. Brad, tell us about the finishes on these. I remember hearing you say something about that once, but forgot what you said. Was it that they give you elbow cancer? 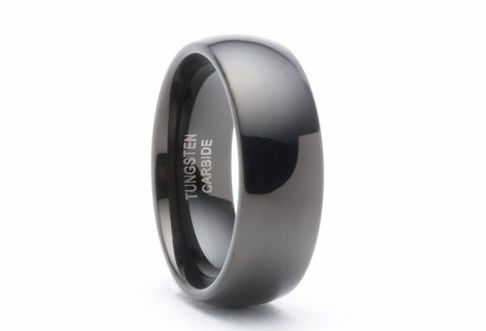 Black tungsten is actually regular tungsten that has been electroplated. I’m curious to see if the finish is as durable. The tungsten ring I’ve owned for a year doesn’t have a single scratch. Will the electroplated ring scratch? And I don’t think they give you elbow cancer. My elbow feels fine. But if something happens and the ring has to be removed in an emergency situation, you don’t cut it off, you squeeze it with a pliers and it breaks in pieces. 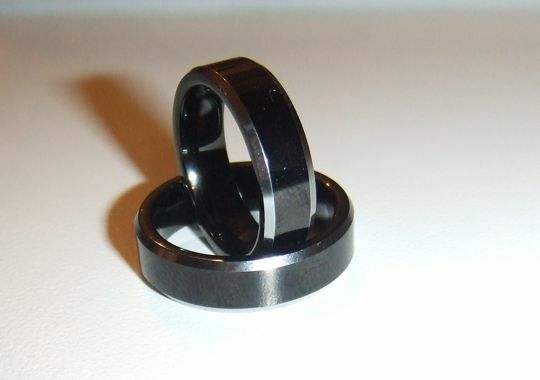 Brad, I’ve heard you can use regular ring cutters on the tungsten -- they just have to cut twice instead of the usual one-cut-and-bend process they use for regular rings. I would guess you wear a 5.5 or 6, Lauren. I just think that. And I think you should return those bands and get the ones on the site now -- because they are so cool. I check The Sparkle Cartel everyday too…but I’ve never thought about getting one of the rings for myself because they’re men’s rings & they look like men’s rings to me. I put in a request before asking Lloyd to find a female ring cartel…I’m still waiting. Tap. Tap. Tap. I don’t really understand twitter & I really don’t mind checking that site alot…what with my ADD and all. But do they ever have more feminine rings? I’ve never seen any. Something simply silver & swirly. Thanks & Holy cow, they are some low prices! I signed up to receive mail from them, but I don’t know if I did it right. It asked 2 things I didn’t understand…yikes! I’ll have to make their regular website one of my favorites.